Some insist corn is a nutritious dog food ingredient while others denounce it as a problematic cereal grain. So, what should you believe? What’s the truth about corn in dog food? Is it good — or is it bad? Well, that depends on whom you ask. In general, anxieties expressed over the use of corn in dog food seem to come from end users — pet owners, breeders and the like. Yet the pro-corn crowd appears to be dominated by those who have a vested interest in products made with cereal grains. Makers and sellers of corn-based foods insist the negative stories about corn are simply unsubstantiated myths and rumors spread around the Internet by uninformed consumers. The truth is, most of the exaggerated claims extolling the virtues of corn actually originate within the pet food industry itself and are unwittingly propagated by naive and well-meaning pet owners. Here are some of the most enduring myths about corn promoted by makers and sellers of corn-based dog foods. The glycemic index is a way of measuring the tendency of a specific food to raise the blood sugar level of an animal. The higher the index, the greater the risk of an unhealthy rise in blood sugar. Compared to most other ingredients used in making dog food, corn does not have a lower glycemic index. Supporters of corn-based products like to point out that corn is one of the least allergenic ingredients in dog food. And according to some studies, that is probably true. One report3 found the incidence of corn allergy to be only 14% while another4 places corn at just 3% of all allergies. In any case, although it may not be a common food allergen, corn still cannot be completely excused as a potential cause. While searching the Internet for these studies, it’s hard not to notice the thousands of legitimate reports by owners, breeders, forums and veterinary sites reporting corn and other cereal grains as a likely cause of their dogs’ allergies. And then there’s the (very real) issue of cereal grain quality. In many cases, problems aren’t so much a matter of allergies to the corn itself but rather to undetected contaminants within that grain. It’s not unusual to find storage mites, their droppings and expired carcasses in bulk lots of feed grains6. And all of these are known to be notable canine allergens. So, for these reasons, corn must still be considered a reasonable suspect when investigating the cause of any food-related canine allergy. As a whole grain, corn is not easily digestible. That’s because unless the kernel is first refined into a meal or a flour and then cooked, corn would be very difficult for a dog to digest. 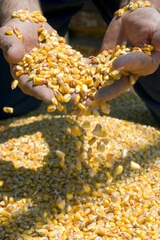 As a matter of fact, corn (and other grains) are only digestible to the extent to which they’re processed. That’s why even though the grain may be listed as “whole” on a pet food label, it’s nearly always first ground before being cooked into kibble. And the finer it’s ground, the more digestible corn will be. But also, the higher its glycemic index. In any case, the industry’s claim that corn is “99% digestible” can be misleading. It’s easy for consumers to interpret that statement to mean corn has a high nutritional value, too. Unfortunately, that is simply not the case. There’s certainly nothing unique enough about corn’s content that makes it a nutritional standout — nothing that can’t be found in — or converted from — some other ingredient. When it comes to its protein usability, corn has a measurably lower biological value. Fans of corn also like to claim the grain is high in anti-oxidants and minerals. High in anti-oxidants and minerals? Compared to what? Aside from its energy content, corn’s nutritional completeness is certainly not exceptional. The Nutrient Balance Completeness Score is a measure of how complete a food is with respect to vitamin, mineral and dietary fiber content. The higher the score of a food, the more complete its nutrients. So, when it comes to judging its vitamin and mineral content, corn is mostly unremarkable. Some pet food manufacturers like to point out that corn is a better source of energy – especially for working animals – than meat. However, science proves this to be yet another myth. Consumers shouldn’t favor a dog food because “protein” is the first ingredient. They should choose a dog food because meat is the first ingredient. That’s because meat doesn’t just contain protein – it also contains fat. Corn is mostly fat free. It’s a carbohydrate. As you can see, ounce-for-ounce, science proves meat contains significantly more energy than corn. So, why is corn used so abundantly in the manufacture of today’s commercial dog foods? Well, as you’ve just seen, surely not because it could be considered more nutritious. Then, could corn be “more natural”? When you study a dog’s natural ancestral history, you won’t find any mention of corn. That is, until the year 1956. For that was the year indelibly marked by the invention of kibble. So, why did the introduction of kibble bring with it such a dramatic rise in the use of corn in making dog food? What suddenly made carbohydrates — like corn, grains and potatoes — so popular with the pet food industry? You won’t find corn in commercial dog food because it contributes some unique nutritional property. No, it’s there simply because it supplies cheap calories to the product. And starchy carbohydrates play a critical role in a process known as gelatinization — a process which is absolutely crucial to the workings of kibble machinery. How often do you find corn or other cereal grains in a raw or canned dog food? In a nutshell, corn makes any pet food you find it in less expensive to produce. And it does this by diluting a recipe’s more costly meat ingredients. Because corn doesn’t just save money for manufacturers — it also makes dog food more affordable for pet owners, too. However, to advertise that corn is included in commercial dog food mainly because of its nutritional benefits is misleading — and a gross misrepresentation of the facts.